This is a piece of pear pie from our first attempt...this pie is SO good. pastry dough/pie crust – we totally cheated and bought one this time. Whisk together flour, nutmeg, salt, and 2/3 cup sugar. Gently toss with pears and lemon juice. Roll out 1 piece of dough (keep remaining piece chilled) on a lightly floured surface with a lightly floured rolling pin into a 13-inch round, then fit into a 9 1/2-inch glass or metal pie plate. Trim edge, leaving a 1/2-inch overhang. Spoon filling into shell. 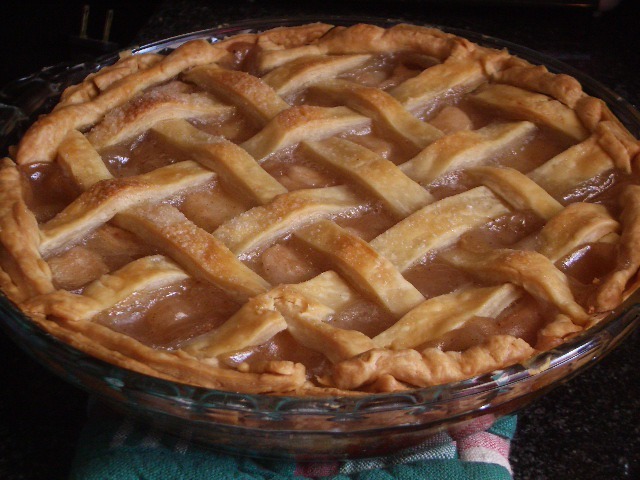 If you have extra dough, extra energy, and extra time – weave a lattice pattern over the pie with more pastry dough. This time, we didn’t do this part. Brush lattice (but not edge) with milk and sprinkle lattice with remaining tablespoon sugar. Bake pie on a baking sheet 20 minutes, then reduce oven temperature to 375°F and cover edge of pie with a pie shield or foil to prevent the crust from burning. Continue to bake until crust is golden brown and filling is bubbling, 50 to 60 minutes more. Cool pie on a rack to warm or room temperature, at least 2 hours (this is important, as it will allow the juices to firm up – if you don’t allow the pie to cool properly, you’ll have pear juice instead of pear pie). This is to die for – totally worth the calories!